When we started KKR 40 years ago with $120,000, our vision was to create a firm with a culture that rewarded collaboration and teamwork, a genuine partnership. 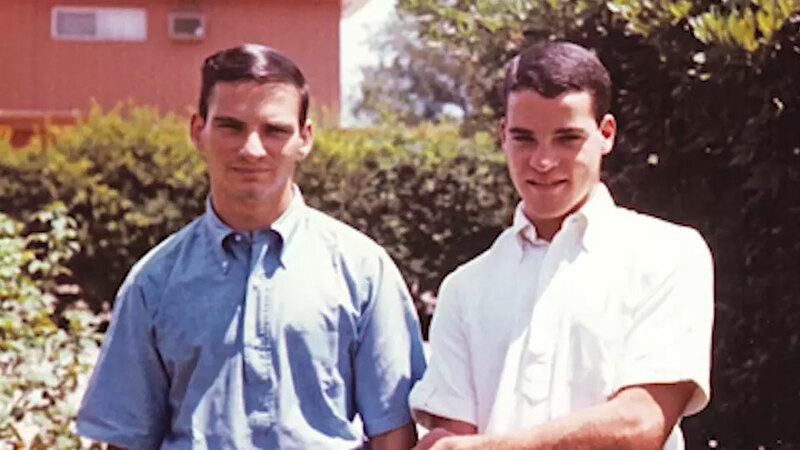 Anniversaries are naturally a time for reflection and true to that we find ourselves thinking about the many changes we’ve navigated since founding KKR on May 1, 1976. For us, today is about giving thanks. We’d like to thank our limited partners, shareholders and employees of our portfolio companies for their trust over the years. We simply wouldn’t be here without you. It’s also important to recognize the women and men who have been a part of KKR, now and throughout our history. From just three employees, we’ve grown to a global investment firm with more than 1,200 people. Your dedication and talents are what have made this model work and you’re the reason we’ve built such deep and lasting relationships with our limited partners and the companies in which we have invested. We’d be remiss if we did not mention our founding partner Jerry Kohlberg who passed away last year. He was a man of integrity and moral courage, and we are proud that we share his name on our door today. KKR started as a U.S-focused PE firm. Today we have multiple types of capital, allowing us to invest behind any idea, anywhere in the world, and we are investing in themes that are solving some of the world’s most pressing challenges. Our journey hasn’t been without its imperfections or mistakes, but we have learned from them and adapted along the way. Overall, we are pleased with the returns generated to help meet the needs of our limited partners, including endowments, public and corporate pension funds, and individuals, as well as our public unitholders. We believe it is our culture and our track record of investment performance that has enabled us to keep the trust of our clients since 1976. We write this letter amid a volatile period for global markets. Many are concerned with how markets will react to uncertainty around global economic growth, fluctuating commodity prices, volatility in the leveraged credit markets, geopolitical unrest and the first interest rate hike by the Federal Reserve in almost 10 years. Although KKR’s publicly traded equity has not been immune to volatility, we have never been more optimistic about the firm’s future and financial profile. Through everyone’s hard work and partnership with our investors, we’ve built a successful franchise by being nimble, innovative, opportunistic, and by constantly learning and evolving – qualities that we hope will carry into our next four decades and beyond. The core of our business is built around managing third-party capital, something we’ve been doing successfully for 40 years. But our firm looks much different than it did in 1976. We’ve worked hard to build a model and culture that sets us apart. Today we can invest in any part of a company’s capital structure and we can leverage our global footprint and one-firm culture to help “connect the dots” and better inform our decision-making. We can put our $9 billion balance sheet to use and invest alongside our LPs in our funds and in other opportunities. And we can add strategic and operational value to these companies and enhance their growth and governance. Additionally, we have a world-class capital markets business that operates globally for our portfolio companies and our clients. As of December 31, 2015, we and our employees and other personnel have approximately $12.3 billion invested in or committed to our own funds and portfolio companies, and every single employee also owns our public equity. In short, we invest like owners... because we are owners. Our goal is to generate attractive risk-adjusted returns for our fund investors and to find ways to participate in the broadest set of opportunities through our funds, our balance sheet and our capital markets business. To do this, we work together, creatively and collaboratively. This is what our culture is really about. Everyone at KKR has a stake in the success of our funds. We don’t just invest the capital of others; we are the largest investor in our funds and strategies through our balance sheet and our personal investments. As of December 31, 2015, we and our employees and other personnel have approximately $12.3 billion invested in or committed to our own funds and portfolio companies, and every single employee also owns our public equity.1 In short, we invest like owners... because we are owners. We’ve seen meaningful growth across KKR since the beginning of 2010. 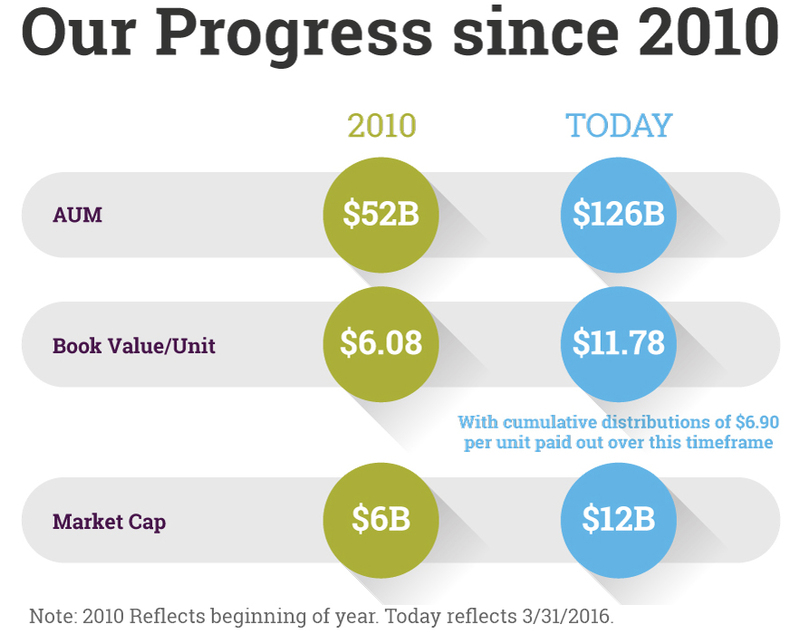 As noted in the graphic on the right, we’ve grown in terms of our assets under management and book value. Since 2010, we’ve invested extensively across our businesses and expanded into new platforms. Our assets under management have grown from $52 billion in 2010 to $126 billion as of March 31, 2016. As companies and the need for capital have expanded into new markets, so have we. We’ve built out our model and coverage. We’ve opened 21 offices in Beijing, Dublin, Madrid, Hong Kong, Seoul and Singapore - to name a few - and we have expanded into businesses such as real estate, energy, credit and infrastructure as well as our hedge fund platform. These new initiatives are maturing, so our focus has shifted to scaling these businesses, and thus far we are seeing tangible signs of success. For instance, this year within our private credit and special situations businesses, we have closed on $3.4 billion for Special Situations Fund II, and $850 million for Lending Partners Europe while also completing a first close on our new Private Credit Opportunities fund. This translates to over $15 billion of assets within our special situations and private credit strategies, which combined with over $19 billion in leveraged credit gives us $35 billion of assets globally in credit. Collectively, our carry-paying funds have $35 billion in dry powder as of March 31, 2016, the largest figure we’ve had in our history. Both our infrastructure and real estate businesses are performing well with an increasingly global presence. We’ve grown the hedge fund platform with the important additions of KKR Prisma and our strategic partnership with Marshall Wace bringing us to approximately $20 billion of assets under management in hedge fund solutions. All of this progress is in addition to strong growth in our core private equity franchise that leverages the relationships, footprint and reputation we’ve built over the past 40 years. Collectively, our carry-paying funds have $35 billion in dry powder as of March 31, 2016, the largest figure we’ve had in our history, giving us ample investment capacity. Our job is to invest. And while that may sound simple, we’ve honed our model to make sure we’re putting our money and that of our investors and limited partners to the best use possible. Inorganic growth. We’ve selectively acquired asset managers, like Avoca and Prisma, and also created strategic partnerships, like Nephila and most recently Marshall Wace. Book value per unit has increased to approximately $11 per unit from $6 per unit since 2010, a period where we paid out the majority of our cash flow in the form of distributions. The critical component of the growth in book value has been investment performance. Balance sheet investment performance has exceeded the MSCI World index in five of the six years since we’ve been a public company. From an IRR standpoint we have delivered a 14% return on this balance sheet capital. Over time, we believe the market should value what we do with our balance sheet more than it valued variable distributions. Additionally, as you’ll recall, we recently changed our capital allocation priorities and announced the introduction of a fixed distribution to replace the variable distribution policy we’ve had to date as a public company and we announced our first unit repurchase program. Through this approach, we expect to retain incremental cash earnings and invest this capital back into opportunities that we deem attractive. Over time, we believe the market should value what we do with our balance sheet more than it valued variable distributions. This change augments our future earnings potential as well as our ability to compound our book value per unit. Another way we’re different from others in our industry is our ability to tap into the expertise of our capital markets team (KCM), which provides advice and develops and implements traditional and nontraditional financing solutions for a broad array of clients. KCM talks directly with end investors such as pension funds, sovereign funds and hedge funds, and the team is able to leverage the firm’s deep relationships to connect those seeking capital with those who have it. What started as a U.S.-based business focused on our private equity portfolio companies has grown into a global franchise with a team of 50 professionals that now work with all of KKR's investing businesses as well as third parties. Since 2010, KCM has underwritten or arranged more than $80 billion in capital in more than 600 transactions. The team is not constrained by the types of financial solutions it can provide. They don't have to be large or repeatable transactions. KCM can tailor solutions to meet a client’s needs. Our greatest asset is – and always will be – our people and how we work together. We set out to build a firm based on teamwork, where everyone prospered together, resources are shared and true collaboration is fostered across the firm. We’ve worked to encourage everyone to be innovative and to leverage each individual’s unique talents and skills – and to bring that to every single investment. Importantly, we incentivize our teams to do this by paying everyone from the same compensation pool, making sure we all share in the gains and losses of all our businesses. Our greatest asset is – and always will be – our people and how we work together. Over the past several years, we’ve built our teams and expertise to better make decisions and generate results. Our investment teams help us find and invest in portfolio companies. Specialized operational experts work with portfolio company management to drive value creation initiatives. Capital markets offers financing from debt to equity in markets across the world. We have a team that focuses on environmental, social, governmental and reputational issues for our current and target portfolio companies, applying a new lens to all of our investments. Our Client and Partner Group has helped us to better understand the needs of our LPs and clients and to better identify where a KKR solution can help a client to accomplish their objectives. We’ve built a sophisticated global macro-economic team that helps inform all of our investment decisions and supports our portfolio companies. Their involvement allows us to more fully understand the environments, countries, economics and policies in the places we operate. At the same time, we’ve invested to grow our internal infrastructure, including areas such as Finance and Accounting, Information Technology, Legal and Compliance and Public Affairs in order to better serve all our constituents and best position KKR for growth. At KKR, it’s more than just putting money to work. As we look for investment opportunities, we’re also looking for ways to engage and improve the communities where we operate and where our portfolio companies are located. In identifying investment themes, we often focus on ideas that address broader challenges. For example, we’ve invested in farm operations in China, bringing international best practices in food safety to a fragmented system. We’ve expanded output and generated strong returns on our investment, all while helping solve the broader problem of access to healthy, quality food. In Europe, we’ve created a joint venture with several banks that aims to provide long-term capital and operational expertise to ultimately work through non-performing loans. This, in turn, allows the banks to strengthen their capital structures and get back to the business of lending. 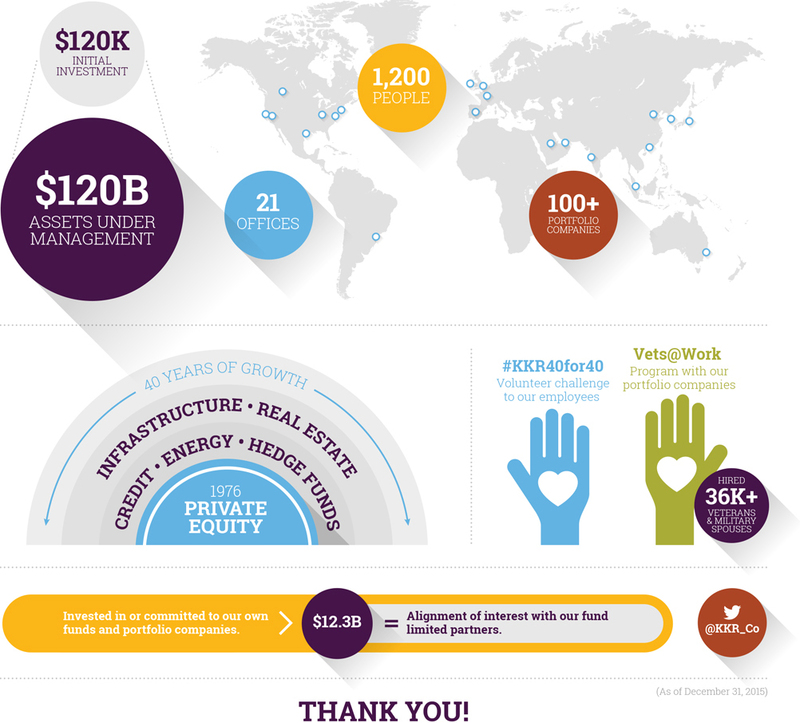 In addition, we are impacting KKR and many of our more than 100 portfolio companies. We have established wellness programs for our employees and their families, and 31 portfolio companies have hired more than 36,000 veterans and military spouses since 2011. It is our responsibility not only to serve our investors through strong investment returns but also to support them by investing in their communities, and those of the companies in which we invest. Initiatives such as our partnership with the Environmental Defense Fund have had environmental benefits as well. Our flagship environmental, social and governance (ESG) partnership has yielded an estimated $1.2 billion in financial impact and avoided approximately 2.3 million metric tons of greenhouse gas emissions or the equivalent of powering 217,000 homes. It has avoided 6.3 million tons of waste or enough to fill approximately 450,000 garbage trucks. We’ve avoided 27 million cubic meters of water use - enough water to fill nearly 11,000 Olympic-sized swimming pools. At KKR, we believe we can make a difference by integrating our performance focused investment philosophy with our ESG initiatives. It is our responsibility not only to serve our investors through strong investment returns but also to support them by investing in their communities, and those of the companies in which we invest. As we begin our 41st year as a firm and reflect on the evolution of KKR, the two most important factors year-after-year have been quite simple: performance and people. Performance has allowed us to invest on behalf of our clients since 1976 and to contribute to the important missions of public and private pension funds, endowments, charitable foundations, sovereign wealth funds and corporations as well as individuals. Helping them meet their financial objectives is our most important achievement. Our people make this happen; our culture and values serve as a guidepost across all that we do. Together, this has helped foster the long-term relationships we enjoy with our partners, several of whom have been investing with us since inception. In this letter we’ve attempted to showcase why we are so optimistic about the future. Over the last several years, we have expanded our platform and created a differentiated business model within financial services all in the framework of a one-firm, collaborative culture. Our focus now, quite simply, is on execution. We thank you for your partnership and look forward to the next 40 years. 1Includes $8.9 billion funded through our balance sheet, $1.4 billion of additional commitments from our balance sheet to investment funds, $1.0 billion in personal investments and $1.0 billion of additional commitments from personal investments. © 2016 Kohlberg Kravis Roberts & Co. L.P. All Rights Reserved.